Genisys™ Pilot Gas Ignition Control with BeckettLink™ | Beckett Corp.
Beckett Solution: Combining the reliability of GeniSys™ gas ignition controls with the BeckettLink™ Tool allows technicians to configure the control or troubleshoot problems using real-time readings and accurate diagnostic history from an easy-to-use web browser interface on their cell phone or tablet. The Beckett GeniSys™ Intermittent Pilot Gas Ignition Control is a 24 VAC primary safety control designed for use in residential and light commercial gas heating applications which use an intermittent pilot for lighting the main burner. Applications may include boilers, furnaces, water heaters, space heating and commercial cooking equipment. 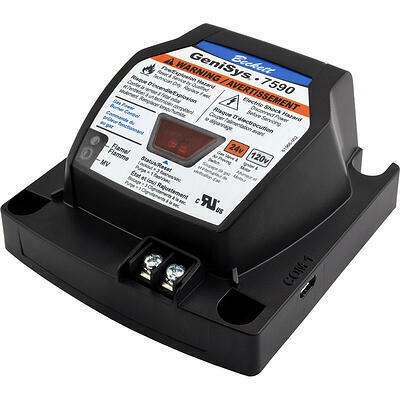 The GeniSys™ gas ignition control includes an integrated spark ignition coil for lighting the pilot and uses flame rectification principles to reliably prove the presence of the pilot flame. The Beckett GeniSys™ Gas Power Burner Control is a safety control designed for use on gas power burners. 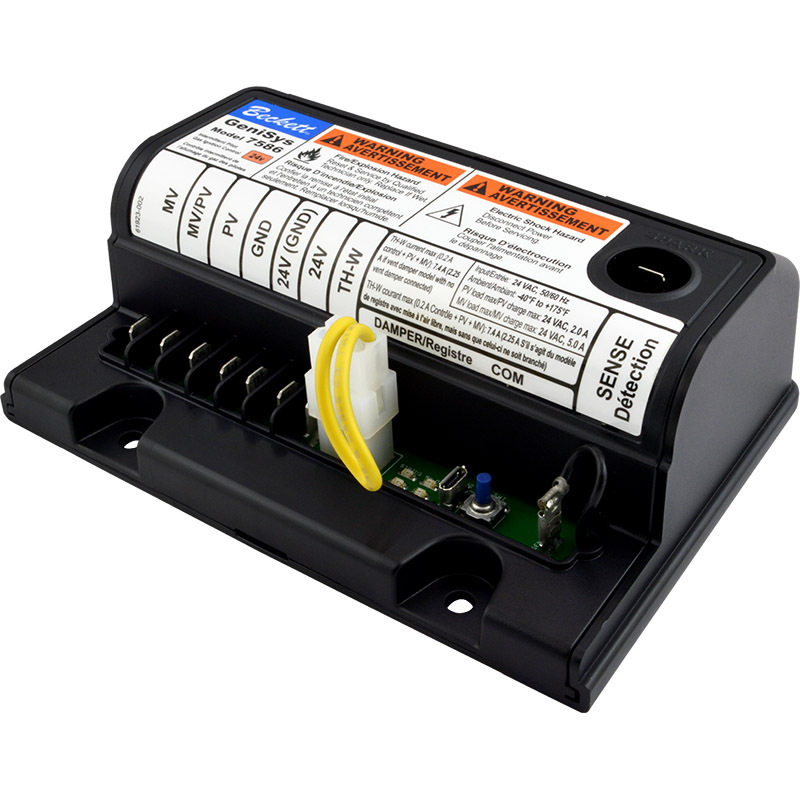 This control is intended for use in residential and light commercial gas heating applications. Applications may include boilers, furnaces, water heaters, space heating and commercial cooking equipment. The 7590 provides supervision of a separate 120 VAC igniter, a 120 VAC combustion blower motor, a 24 VAC gas valve and 24 VAC connections for an air proving switch (on 7590 C, D). The control uses flame rectification principles to prove the presence of the burner flame. Basic diagnostic information is provided through 3 LEDs. Additional diagnostic information and control setup will be available through a separate diagnostic tool. Use only with Beckett 7474 Gas Igniter. 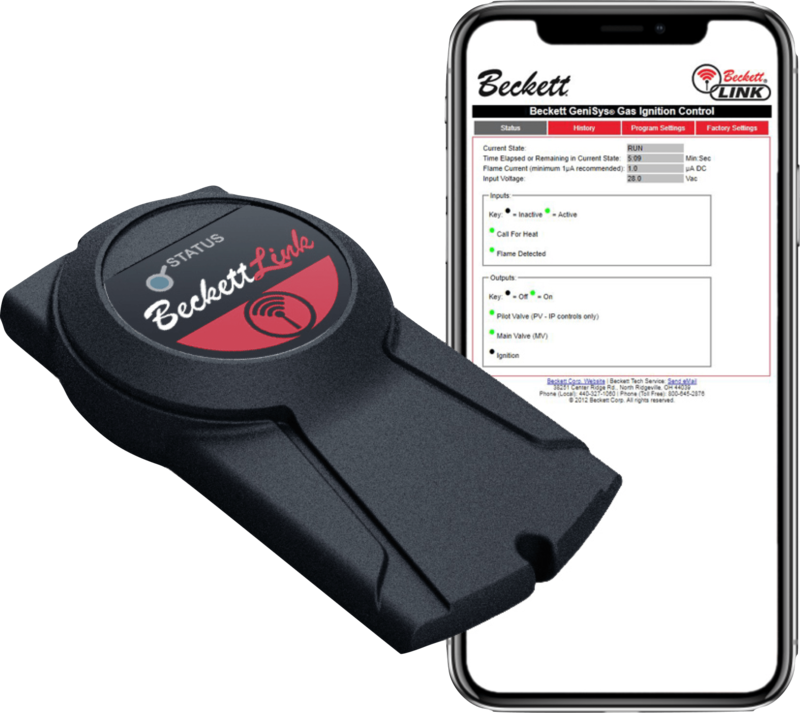 The 7700A BeckettLink™ Diagnostic and Configuration Tool is designed for use with a smart phone or tablet to configure and troubleshoot Beckett Gas Ignition Controls. When connected to a 7586 or 7590 ignition module, the BeckettLink Tool allows technicians to use the web browser on their cell phone or tablet to configure the control, check current status or troubleshoot the control using the diagnostic history. BeckettLink allows technicians to configure the 7586 gas control to replace just about any gas intermittent pilot ignition control. Since 1984, Beckett has made available a quick-reference guide of our burner specifications that were used in OEM applications. Over the years, this guide has proved to be an invaluable resource for the installers and service technicians who support our industry. And now, we've made this guide available as both an interactive guide and a downloadable PDF that you can read offline or print. This guide, in combination with your skill, experience, use of test instruments and accurate technical specifications will help you provide the very best service for your customers.